Here is my 1st entry to this contest. Also in terms of the favourites so far @Gelectrode has the most with Careless Knife-Thrower at 10, I have the second most with In the Ring at 6, and @icyyou the third most with Pancho, Freak Show Manager at 4. 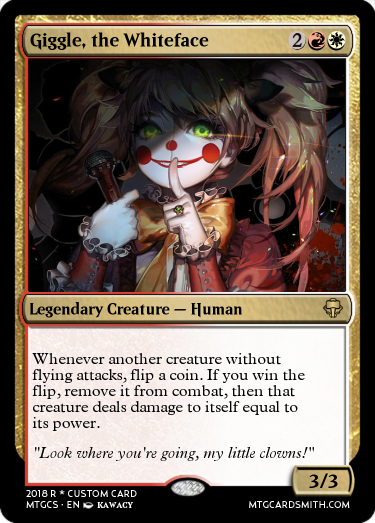 Bite-size sample of a "clown" tribal that focuses on Skulk and Deathtouch to undermine big creatures. 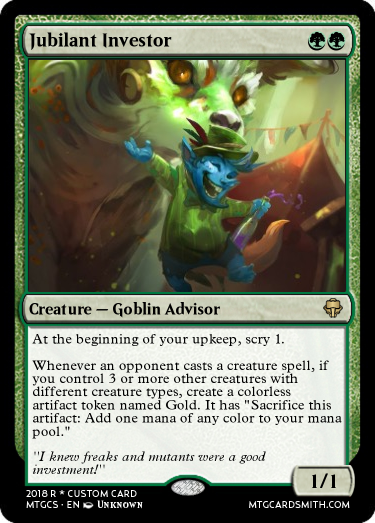 Secondary functionality to support discard and graveyard recursion could be mixed well with reanimators or Madness effects. All art by the artist Michele Frigo. Couldn't get enough of this art in there! 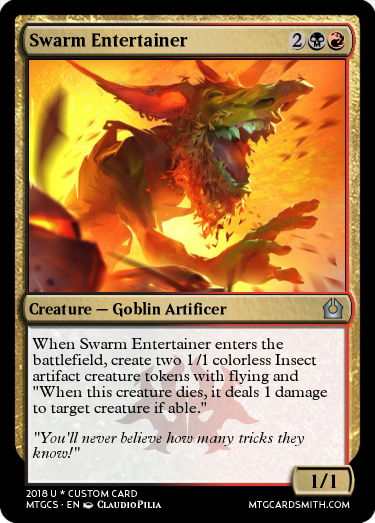 Notice that the Insects have a modified version of the new Devil token mechanic, both have to deal a damage when they die, but the Insects can only target creatures. This means that you can't shoot an opponents face with no preferable targets, you'll just have to shoot one of your own creatures. Rakdos! Every good circus needs a finishing act to really knock 'em dead! 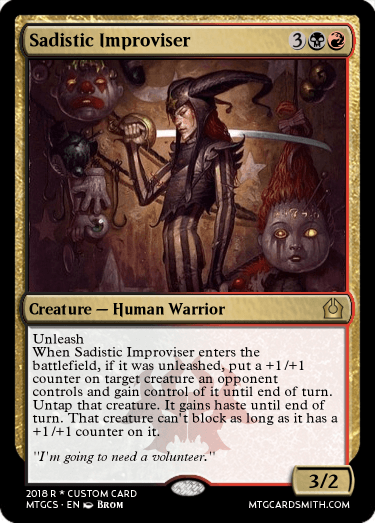 Look at his cute smile... Who wouldn't love his Rakdos circus! There is no boring moments in this show, which keeps getting wilder after every act! Let your ideas run freely in this circus and break a leg! @sanjaya666 - I believe the colors are correct. 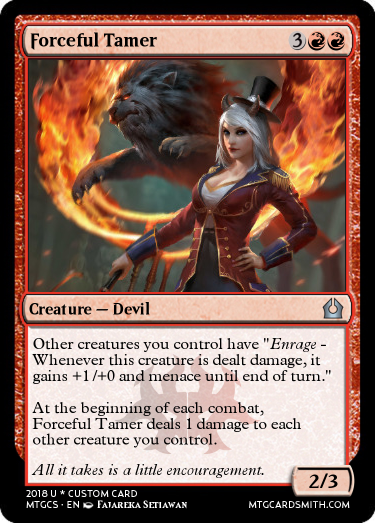 The ability could work in a mono-red card as well. @Swegboss12 - I'm glad you're enjoying the circus! Your list may inspire people when they've seen what kind of shows there have been already. Isn't that Baby from the FNAF series? @AustinSmith - Yes, it's a fanart from a FNAF character, but I used it to create an original Legendary Creature. Haha! Come one, come all, to the greates show in the multiverse! Unless you want to live, that is! 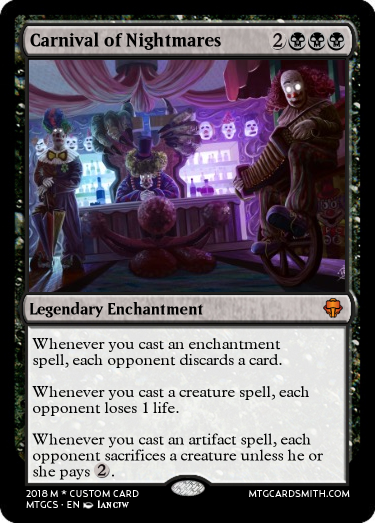 I wanted to make a card that represented the actual circus itself, not just a single part of it. The idea is that you, the player, fills the circus with different twisted and demented things. 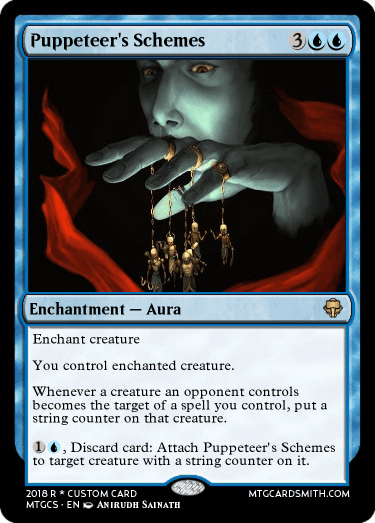 The circus then punishes your opponents accordingly. I have here 3 entries right now, hope to get a fourth in soon. 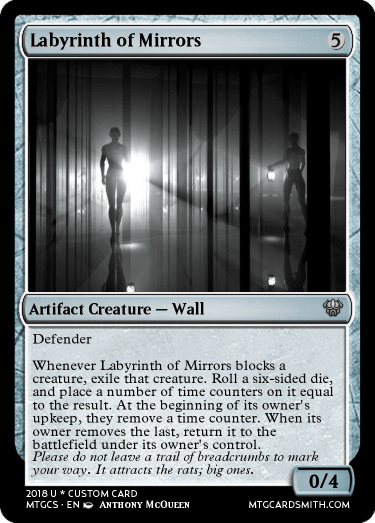 Come get lost at the hall of mirrors, and disregard the bodies. Then dive right into the spectacle of a life time with the flying trapeze. and finally stick around for Furralis the Magnificent, who can do a lot more then read your palm. It's the half-time of the show! Only one week left until the due date, which is January 24th, 2018! Every single one of you has done great job! Those who still have acts left: Show the audience what kind of amazing spectacles you still have up your sleeves! Who isn't entertained by a little scientific demonstration at the circus? While I'm bumping this show with Music Carnival, I would like everyone in the audience and behind the scenes to check out these two challenges! The circus ends in four days! You still have time to participate in those cool challenges and show your acts in this circus before the due date! I will reward a participant from both challenges with 2 favorites of their choice or a follow! 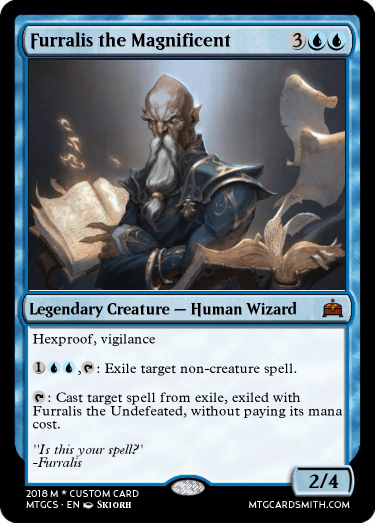 Hey, how do you upload cards from magic set editor to websites like the mtgcardsmith forums? I post them into Dropbox, then link them with HTML. Dropbox tends to be the best overall, unless you need it for something else specifically. 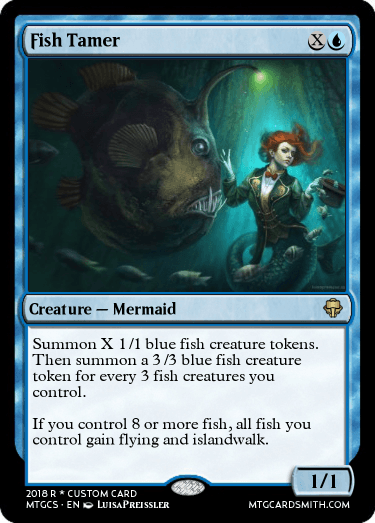 Do the same thing as you would do here, as shown with the html links so graciously given to us all by @modnation675 here (link below), except you'd either have to link it to a MTGCS page or just post the image. A dazzling start for our final act! This card is actually a reference to the Pale Moon clan from another TCG I played before MTG, Cardfight!! Vanguard! 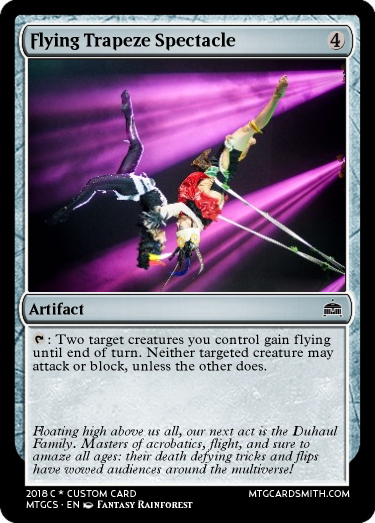 The Pale Moon clan is a group of circus performers who use circus acts as a disguise for a goal more beautiful than parlor tricks... assassination! 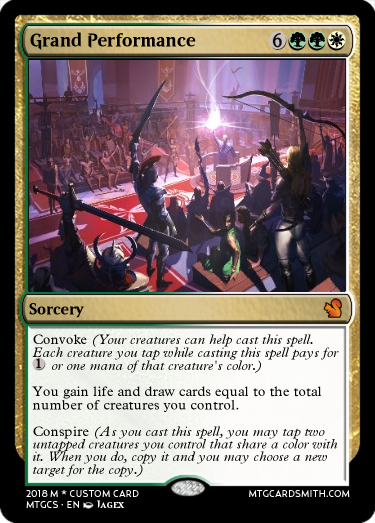 The art used here is actually also a card from the Vanguard TCG, but I did try to translate Vanguards mechanics into a way the MTG player can understand. 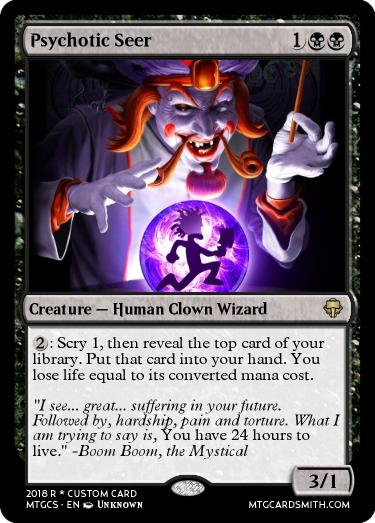 This card isn't a one for one copy of the card the art was referenced by, just as a representation of my idea for what the Pale Moon Circus would look like if they would exist in the MTG world. 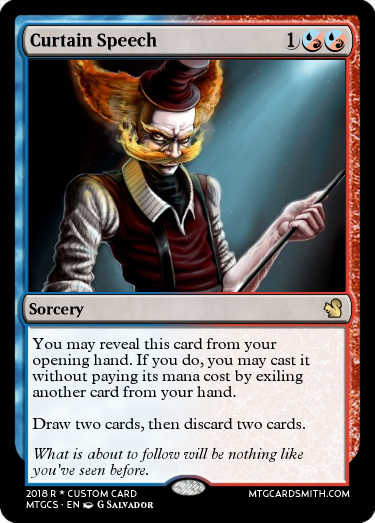 The card image is broken. Come one, come all, to the greatest show this side of Krampus Major! 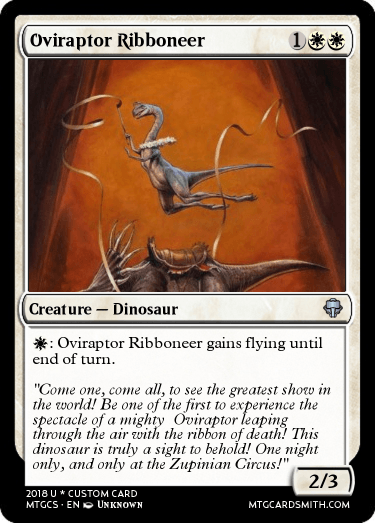 In the main ring, experience the spectacle of a mighty Oviraptor leaping through the air with the ribbon of death! This dinosaur is truly a sight to behold! In the side show, our friendly staff of fortune tellers and seers will dictate your future right before your eyes! And finally, for our investors and wealthier guests, come on down to the after party once the show has concluded! We have Krampaign, Elderberry Wine, and Butterbeer! What do you have to lose? Come on down to the Zupinian Circus today!